I worked on Sweet Treats last night. The new installment is out and I should be getting it in the mail pretty soon from Handcrafts Online, so I thought I'd stitch as much as I could until I got the pattern. 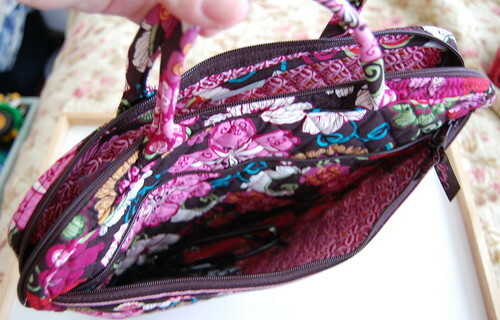 Zippered side pocket - perfect for keys, glasses, wallet, etc. sweeet treats is looking great. Love your Vera Bradley bag. I just won 2 Vera bags on e-bay the molly and Betsy in the botanical pattern, can't wait till they arrive. Don't you just love them ! Such a smart idea to use the laptop case for a stitching bag, it's the perfect size. And then if you ever need to schlep your laptop somewhere, you're all set. 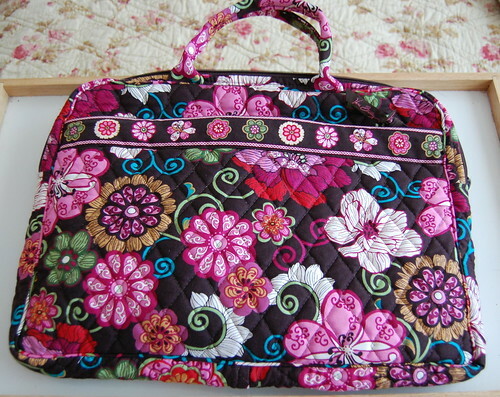 I bought a Vera Bradley laptop case for my Quaker Christmas SAL necessities and I just love it. I bought the new design, yellow bird. Love that bag!! And I can't wait to see your progress on the newest installment of Sweet Treats when you get it. Nicely done ... hopefully the new pattern will arrive soon! No! No more Vera Bradley enabling! I can't take it...I love them all! Seriously though Nicole, that bag is just gorgeous. I am currently attempting to sew a VB look-alike, something like the Hipster. So if anyone sees one IRL, can you tell me how it's finished at the top? Zipper or magnetic closure? Sweet Treats is looking yummy! Very exciting waiting for the next installment. Great idea for your VB bag. I love using things for something different than their original intention. Nicole, I'm sure you "need" that Vera bag...since you are leaving for S. Carolina on Friday. LOL! Love your Sweet Treats! Enjoy and have a safe trip! Great bag, I can see why you fell in love with it. 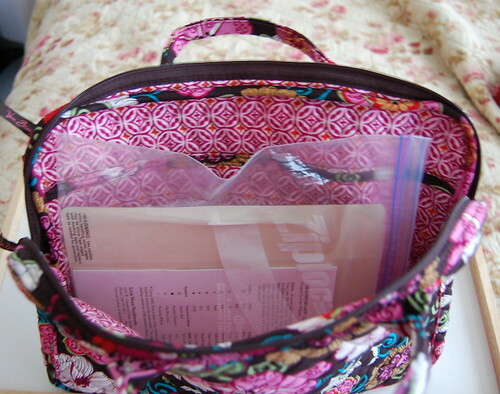 And its the perfect size for stitching goodies. 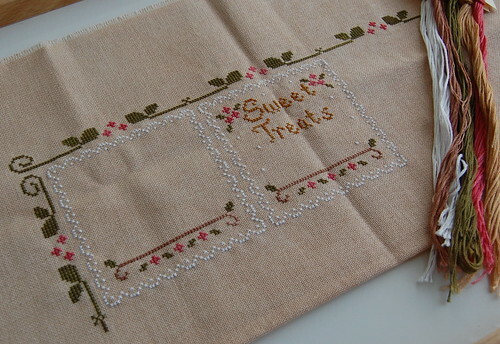 Lovely work on Sweet Treats! Your ST is looking great! Love that bag! And you've enabled me with Sweet Treats - I have one on the way to me as well! Love it! !